Propelled by 27 rocket engines, the Falcon Heavy packed more than 5 million pounds of thrust at launch, roughly three times the force of the Falcon 9 booster that until now has been the workhorse of the SpaceX fleet. CAPE CANAVERAL, Florida -- A new SpaceX jumbo rocket designed to become the world's most powerful launch vehicle in operation took its highly anticipated debut test flight on Tuesday from Florida, carrying a cherry red Tesla Roadster as a mock payload. The launch was successful as broadcasts of the event showed the rocket heading into space on Tuesday afternoon. 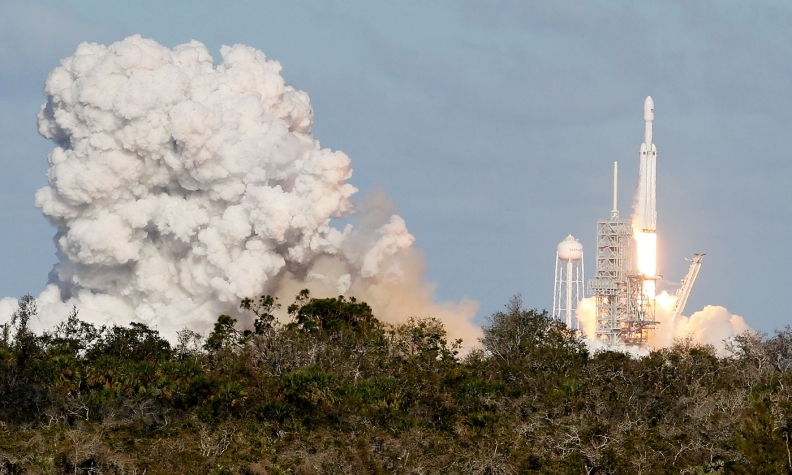 The launch time at the Kennedy Space Center in Cape Canaveral for the 23-story-tall Falcon Heavy rocket was delayed for more than two hours, until 21:45 p.m. CET, because of wind-shear conditions, according to the launch control team. The successful launch could be a key turning point for Silicon Valley billionaire entrepreneur Elon Musk's privately owned Space Exploration Technologies, giving him a new edge over the handful of rivals vying for lucrative contracts with NASA, satellite companies and the U.S. military. A crowd of several hundred spectators packed a campground at Jetty Park near Cocoa Beach, roughly 5 miles from the space center, to watch the blastoff. The new heavy-lift rocket is essentially constructed from three Falcon 9s harnessed together side-by-side, and Musk has said that one of the most critical points of the flight will come as the two side boosters separate from the central rocket in the first few minutes after blastoff. "It's going to be an exciting success or an exciting failure," Musk said on a conference call on Monday. Going along for the ride in a bit of playful cross-promotional space theater will be the sleek red, electric-powered sports car from the assembly line of Musk's other transportation enterprise, Tesla. 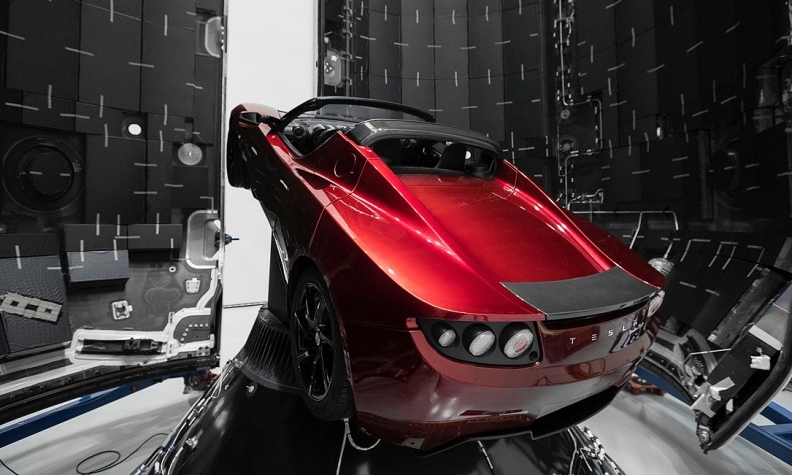 The Tesla Roadster was sent into a virtually indefinite solar orbit, on a path taking it as far from Earth as Mars. 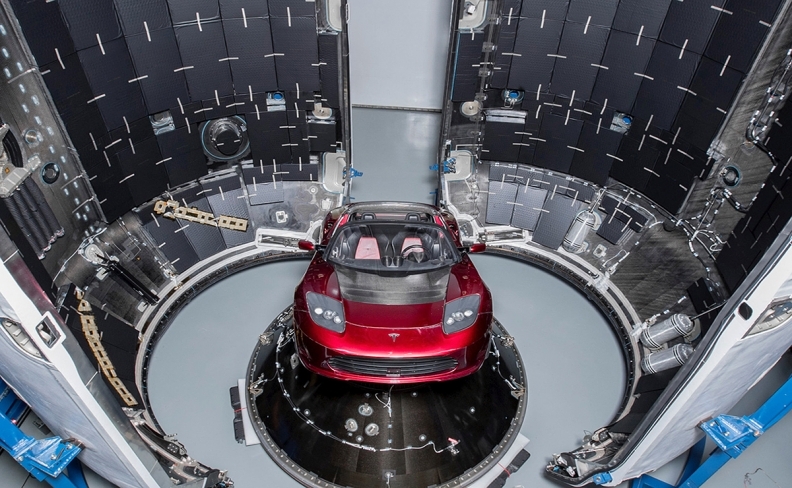 The Tesla Roadster was expected to be sent into a virtually indefinite solar orbit, on a path taking it as far from Earth as Mars. Adding to the whimsy, SpaceX has planted a space-suited mannequin in the driver's seat of the convertible. If the demonstration flight succeeds, Falcon Heavy will rank as the world's most powerful existing rocket, with more lift capacity than any U.S. space vehicle since the era of NASA's Saturn 5 rockets that took astronauts to the moon some 45 years ago. Falcon Heavy is designed to place up to 70 tons into standard low-Earth orbit at a cost of $90 million per launch. That is twice the lift capacity of the biggest existing rocket in America's space fleet -- the Delta 4 Heavy of rival United Launch Alliance, a partnership of Lockheed Martin Corp and Boeing Co -- for about a fourth the cost. Like the Falcon 9, Falcon Heavy is built to capitalize on cost-cutting reusable rocket technology, with each of the three main-stage boosters designed to fly back to Earth after launch. The two side-boosters are supposed to touch down on landing pads at Cape Canaveral, while the central booster should land on a drone ship at sea.